The Pew Research Center’s Teen Relationship Study was funded, designed and analyzed by Center staff. Fieldwork was conducted by the GfK Group (GfK, formerly Knowledge Networks.) Specifically, the survey examined the attitudes of teenagers age 13 to 17 years old, as well as those of their parents, toward technology. The survey examined friendships and romantic relationships within the context of technology use. The survey was conducted using sample from KnowledgePanel. The main data collection field periods were from September 25, 2014 through October 9, 2014 and from February 10, 2015 to March 16, 2015. In the fall, 1016 parent-teen pairs were interviewed. The survey was re-opened in the spring and 44 pairs were added to the sample. The second data collection was targeted toward African-American parents and teenagers, with the intent of increasing the number of African-American teens in the sample to reportable levels. Parents completed the parent section of the survey in 6 minutes (median). Teens completed the teen section of the survey in 16 minutes (median). The survey was conducted in English and Spanish. Parents and teens could select different languages for the survey. While 1084 parents completed the parent section of the main survey, 1060 teens completed the teen section of the main survey; the 24 unpaired parents were not included in the final counts. 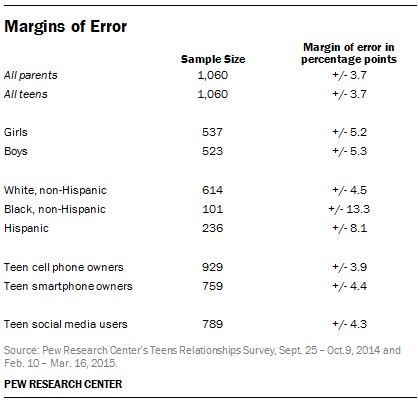 The margin of error for the full sample of teens (n=1060) or parents (n=1060) is plus or minus 3.7 percentage points. Please see the adjacent chart for the margin of error for subsamples in this study. After initially accepting the invitation to join the panel, participants are asked to complete a short demographic survey (the initial profile survey); answers to which allow efficient panel sampling and weighting for future surveys. Completion of the profile survey allows participants to become panel members, and as in the past, all respondents are provided the same privacy terms and confidentiality protections. For this survey, a nationally representative sample of U.S. parents of teens age 13 to 17 was selected. The general sampling rule is to assign no more than one survey per week to individual members. Allowing for rare exceptions during some weeks, this limits a member’s total assignments per month to four or six surveys. The starting weight for the teen’s is the final parent weight multiplied by the number of children age 13 to 17 years old in the household (1, 2+). Detailed information on the demographic distributions of the benchmarks is available upon request. Please contact Amanda Lenhart at alenhart@pewresearch.org for more information about the study methodology.